We've finally found and given you the key to happiness with this Low Carb Peanut Butter Recipe. The process might seem long, and yes, it is , but if there is anything worth waiting for, this is it! The intensity of the roasted flavor and chunkiness of the freshly processed, homemade peanut butter is truly difficult to put into words. We highly recommend you make this recipe for yourself and be sure to do it in bulk because it won't last very long. Watch me make it below! What's Up With The Carbs In Peanut Butter? Finding the right peanut butter can be a daunting task - the options are endless from natural to chunky! Maybe you've never really thought about it and just always buy the Skippy or Jiff brand, but something important to note is the carb count. Many "healthy" peanut butters are filled with unnecessary sugars upping the carb count, which is why we've chosen to make our own nut butters at home! However, if you don't have the time you can always look for our go to brand - C﻿﻿razy Richards Peanut ﻿﻿Bu﻿﻿tte﻿﻿﻿﻿r - Richard will never steer you wrong! If you can't find Crazy Richards, just read the nutrition labels and look for nut butters that don't have any added ingredients aside from peanuts, a fat source and some salt. Top You Favorite Low Carb Desserts With This PB! We have two or more jars, (and I'm talking the big mason jars), full of homemade nut butters in our fridge on any given day, so of course we are spooning it directly into our mouths. But, what are some other ways to use your nut butter? Well, you can top our Low Carb Waffles, Low Carb Chocolate Chip Cookie﻿s, or even just a thick slice of Keto Bread! Some tips for making your nut butter to your liking is adding different spices - we think cinnamon would be great! You could also use any type of fat source you have at home, and even up the fat content to lower the carb count even more. We've given you a great nut butter base here so play around with it and work in some other nuts too! If you didn't watch the video we touched on the benefits to sprouting nuts. Sprouting allows all the great nutrients and fats in the nuts to be more bio-available and easily digested by your body. If you find you have a little tummy rumbling or bloating after eating nuts, but you love them too much to give up, give sprouting a try and see if you notice a difference! 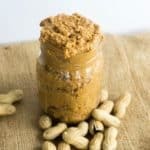 Making a homemade nut butter, especially this Low Carb Peanut Butter, could also be a fun activity you do with your family along with cutting some carbs for all you peanut butter addicts out there! Recipe can be quickly added to MyFitnessPal - Search "KetoConnect - Low Carb Peanut Butter"
Pour the raw nuts into a shallow dish and rinse a couple times with tap water. After rinsing the peanuts cover them in 2 tsp pink salt and cover the peanuts with filtered water. Set the peanuts aside anywhere from 12 to 36 hours. Change out the filtered water covering your peanuts every 6 hours. After the peanuts have soaked in the filtered water, drain the water and cover the peanuts with damp paper towels. Allow to sit for 12 hours. Remove the paper towels and spread them out in an even layer onto silicone mat or parchment paper lined baking sheets. Place them in the oven at the lowest temperature your oven goes - we did 170 degrees - for 4 hours. After 4 hours, turn the oven temp up to 250 and roast for another 2.5 hours. Once peanuts are dried out add them to your processor and process for 1 minute. Add in the MCT oil, stevia, and remaining pink salt(1 tsp) and process for another 3-4 minutes. A good tip to do as you process is to stop the processor as you see the peanuts work up the side and push them down with a spatula (as seen in the video)! After about 5 minutes total your peanut butter is done! You can store it in a mason jar in the fridge or on the shelf and enjoy at your leisure. TIP: For every lb of peanuts use 2 tsps pink salt. NOTE: You can use any kind of MCT oil you have, coconut oil, olive oil, avocado oil or butter! You can up the oil/butter level to create a creamier consistency.